In order to render the look of bronze, while having less weight, these national trophies were created using 'cold-cast' bronze. Once I had designed the motif, I sculpted the original piece in plaster. This was then moulded and castings made. The bronze pieces were then polished and a wax finish was then applied by hand to render a durable finish and enhance the colours of the bronze. The timber base was turned and stained to complement the bronze and then polished. 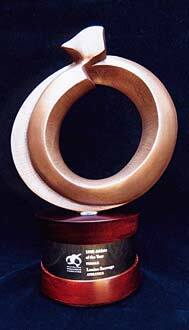 As these are perpetual trophies the alloy engraving surface allows for up to six years of recipients to be recorded. At the end of their winning year the recipient returns the trophy and receives a gold pendant that I designed around the trophy motif.